The preview release of OpenSim 0.8.1 is out, with improvements to teleports, physics, varregions, scripting, and more. For large commercial grids, this is an opportunity to check out the new release on their beta grids, so that they are ready for the final release when it comes out — and can report any bugs or other problems back to the developers. Everyone else should wait for the official release, or, if they are particularly conservative, wait for everyone else to upgrade, see if there are any bugs still left, and then upgrade once those bugs are fixed. Currently, the official, recommended release of OpenSim is 0.8.0.3. There are only a couple of changes which could cause compatibility changes. One is the way that that scripts get stopped, which might require that scripts be recompiled. Another is that the MSSQL database is no longer supported, since it has not been maintained for the past two years and nobody has stepped forward to volunteer to support it. The only major grid that had used MSSQL, a commercial database from Microsoft, was ReactionGrid, which is now closed. Most grids today use free, open-source databases such as MySQL and PostgreSQL. 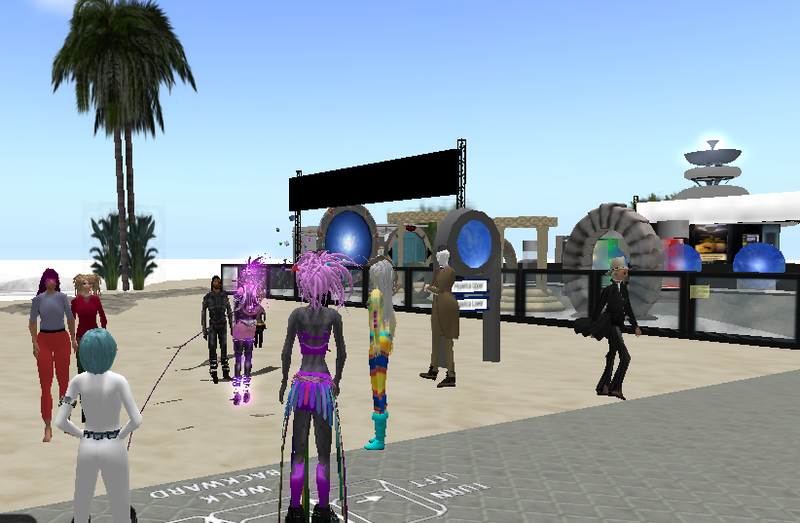 The Hypergrid Safari visits the Hyperica hyperport. According to the 0.8.1 release notes, the new version of OpenSim fixes several attachment issues for hypergrid teleports. For example, in previous releases, attachments would sometimes disappear, or appear twice. This has now been fixed, as have issues with multiple attachments. Region crossings have also been improved, such as for cases where an avatar crossed back and forth between two regions very rapidly. In addition, velocity and avatar travel direction is now maintained. The version of BulletSim used has been upgraded to 2.82. In addition, avatars no longer flop on the floor when flying at low heights, terminal falling velocity has been implemented, and several other problems have been fixed. Several scripting problems have been fixed, including incorrect line numbers for error messages. For example, llSetPrimitiveParams calls are no longer ignored after llSetTextureAnim(FALSE) and calling llStopMoveToTarget in an attachment script will now stop the avatar if it was moving to a target. Of particular interest to education and business users, there is now an osForceOtherSit command. This means that a script can now force other avatars to sit down without asking their permission first. This requires the threat level to be set to Very High, since there’s plenty of potential here for abuse. Bullet physics roller coaster by Michael Cerquoni, also known as Nebadon Izumi in-world. Click image for full video. Teleporting via the map to varregions has also been improved. Previously, neighboring varregions would sometimes not show up for users — that has now been fixed. Also, varregions can no longer accidentally overlap other regions. The “show grid size” console command was implemented back in July, but has only been available to grid owners running experimental versions of OpenSim. It will now be available to everyone. This is particularly useful for grids with varregions, since a varregion only shows up as a single region in the regular grid statistics, no matter how big it is. This leads to an undercounting of land area. 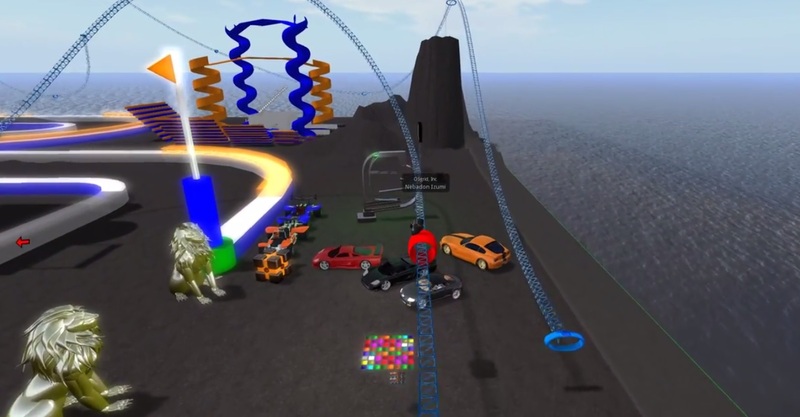 Since one of the major attractions of OpenSim is low-cost, unlimited land available for projects that need a lot of it, having an accurate count of how fast OpenSim’s land area is growing is a major promotional tool for the platform. Grids that undercount their land area by not fully accounting for varregions do a disservice to OpenSim as a whole. I’d like to remind folks that once people come to OpenSim for any reason, they are then more likely to explore the rest of what OpenSim has to offer. They might be initially attracted by cheap land, but might settle on a more expensive commercial grid because they like the community there. Or they might be attracted by a commercial grid’s marketing, but then, after finding out more about OpenSim, also start running their own regions on their home computer.